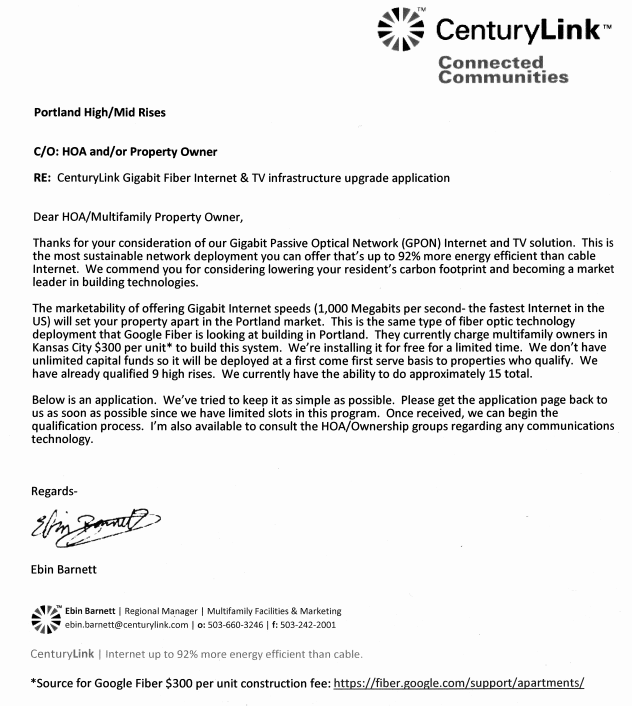 In the wake of Google's announcement that Portland could be one of the next communities for the Google Fiber network, CenturyLink is circulating an offer to select apartment buildings to apply for CenturyLink fiber. This appears to be more than the standard fiber-to-the-press-release responses we often see from the big telephone companies that prefer to lobby, litigate, and lie rather than invest in next-generation networks. CenturyLink notes it has the "ability to do approximately 15 total" apartment buildings. 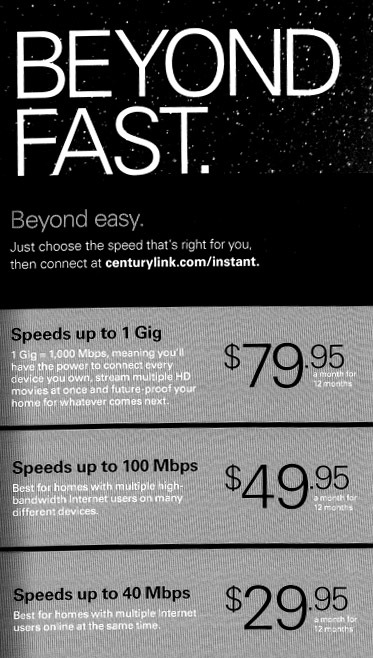 The promotional sheet claims CenturyLink will offer speeds "up to" 1 Gig for $79.95/month for 12 months. 100 Mbps runs $49.95 and 40 Mbps is $29.95 - each for 12 months. No mention of upload speeds but CenturyLink has demonstrated a real aversion to symmetry so users can expect far slower upstream than what modern municipal networks and Google fiber deliver. The standard operating procedure in apartment buildings will be for CenturyLink to try to lock up the internal wiring to buildings and deny it to competitors. FCC rules make exclusive agreements with landlords unenforceable, but there are a host of tricks that incumbents use to prevent any competition and landlords getting a kickback often have little reason to encourage competition. The CenturyLink copy notes that its fiber optic GPON option is "up to" more than 92 percent energy efficient than cable modem Internet access. I have to wonder how it compares to DSL energy efficiency and whether that number holds up better than the "up to" 12 Mbps claims they make on DSL circuits that seldom peak at 5 Mbps. At any rate, it is more than we can expect in the many communities CenturyLink is serving where there the local government have done nothing to spur competition by investing in publicly owned assets that could form a municipal network or be used to entice independent service providers to enter the market. In particular, I would be curious where else CenturyLink is rolling out fiber to buildings without any upfront charges. In a very quick turnaround, a number of prominent companies have signed on to a letter opposing the Kansas bill to block competition for existing Internet providers, like Time Warner Cable. Firms signing the letter sent to the Commerce Committee include Alcatel-Lucent, American Public Power Association, Atlantic Engineering Group, Calix, CTC Technology & Energy, Fiber to the Home Council, Google, National Association of Telecommunications Officers and Advisors, OnTrac, Telecommunications Industry Association, Utilities Telecom Council. The Committee will hear the bill on Tuesday morning. We understand that no recording or live streaming is planned. Update: When originally posting this, I failed to credit Jim Baller - who organized the letter and works to preserve local authority, so communities themselves can decide whether a network is a wise investment. We, the private-sector companies and trade associations listed below, urge you to oppose SB 304 because this bill will harm both the public and private sectors, stifle economic growth, prevent the creation or retention of thousands of jobs, hamper work force development, and diminish the quality of life in Kansas. In particular, SB 304 will hurt the private sector in several ways: by curtailing public-private partnerships; by stifling the ability of private companies to sell equipment and services to public broadband providers; and by impairing economic and educational opportunities that contribute to a skilled workforce from which businesses across the state will benefit. Following the introduction of SB 304 to limit investment in Internet networks in Kansas, which we covered on Tuesday, we saw some early reactions from those who fear the bill will effectively stop new investment in networks, much to the benefit of the big cable and telephone companies already providing service. We quickly saw a new Facebook page - Kansans for Broadband Access - and a related website by the same name. In Chanute, a rural community with an impressive municipal network serving businesses and anchor institutions, the local paper covered overwhelming disapproval. The city opposes the bill because it’s legislation that allows lawmakers in Topeka to define what local communities can or cannot do. Phil Jarred of Jarred Gilmore & Phillips PA said the two private companies providing internet services, CableOne and AT&T cannot meet the needs his business requires. Stacey Higginbotham at GigaOm noted that it curiously bans both municipal networks and the types of partnerships that Google and Kansas City formed, finishing with "it looks like incumbent providers are fighting back with politics." This is nothing new of course - companies have sought for years to protect their businesses with laws limiting the competition rather than investing or being innovative. But when it comes to an essential infrastructure, we should be particularly careful. This the second in a series of posts exploring lessons learned from the Seattle Gigabit Squared project, which now appears unlikely to be built. The first post is available here and focuses on the benefits massive cable companies already have as well as the limits of conduit and fiber in spurring new competition. This post focuses on business challenges an entity like Gigabit Squared would face in building the network it envisioned. I am not representing that this is what Gigabit Squared faced but these issues arise with any new provider in that circumstance. I aim to explain why the private sector has not and generally will not provide competition to companies Comcast and Time Warner Cable. Gigabit Squared planned to deliver voice, television, and Internet access to subscribers. Voice can be a bit of hassle due to the many regulatory requirements and Internet access is comparatively simple. But television, that is a headache. I've been told by some munis that 90% of the problems and difficulties they experience is with television services. Before you can deliver ESPN, the Family Channel, or Comedy Central, you have to come to agreement with big channel owners like Disney, Viacom, and others. Even massive companies like Comcast have to pay the channel owners more each year despite its over 10 million subscribers, so you can imagine how difficult it can be for a small firm to negotiate these contracts. Some channel owners may only negotiate with a provider after it has a few thousand subscribers - but getting a few thousand subscribers without good content is a challenge. Many small firms (including most munis) join a buyer cooperative called the National Cable Television Cooperative (NCTC) that has many of the contracts available. But even with that substantial help, building a channel lineup is incredibly difficult and the new competitor will almost certainly be paying more for the same channels as a competitor like Comcast or Time Warner Cable. And some munis, like Lafayette, faced steep barriers in just joining the coop. Google knows how to differentiate its gigabit Internet access from the slower options offered by cable and DSL. Community networks should take notes on effective advertising.